OMG Posters! » Archive "Know Your Dino" Art Print by Dave Perillo (Onsale Info) - OMG Posters! Acid Free Gallery, brand new kids on the block, will release this great art print by Dave Perillo next week. 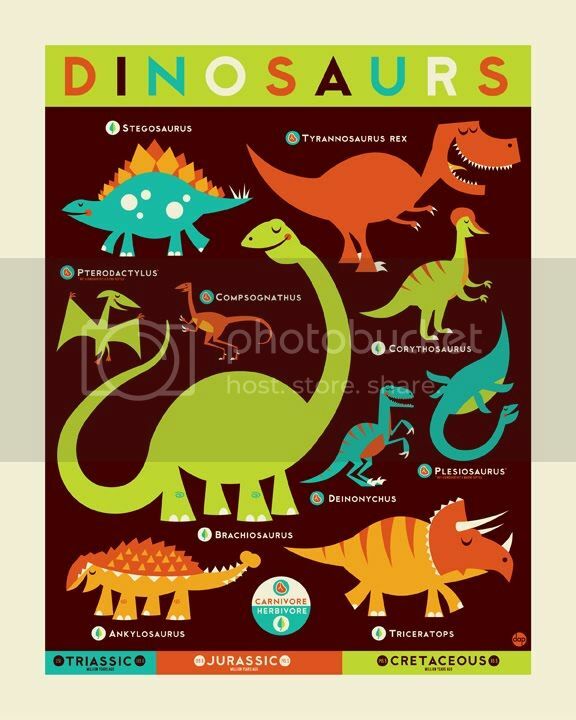 “Know Your Dino” is a 16″ x 20″ giclee, has an edition of 50, and will cost $45. There is also an edition of 5 stretched-canvas versions for $125 each. Everything goes up Tuesday, February 6th at a random time (follow them on Twitter for an exact time). Visit Acid Free Gallery. Love this! But giclée? Really? If ever there was a print ready and waiting to be squeezed through the screens, this is it. Oh well. This looks great but a run of 50 could make this hard to grab a copy. Lovely, so fun. Shame about the limited run. missed this one. damn it!